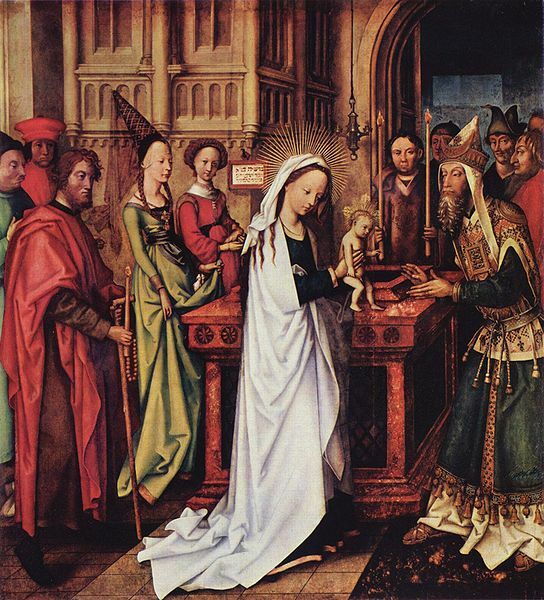 February 2 might be Groundhog Day in the United States, but it’s also Candlemas on the Christian calendar. It’s the day when the Church celebrates Joseph and Mary’s presentation of the baby Jesus at the Temple in Jerusalem forty days after his birth, in keeping with the Jewish tradition of ritual purification and redemption of the firstborn. Despite the Catholic church’s official rejection of such theories, some believe that Candlemas was created to Christianize a pre-existing Roman holiday, Lupercalia, or perhaps a pre-existing Celtic holiday, Imbolc. Lupercalia was the feast of Lupercus, the god of fertility and herds. Imbolc was the feast of the goddess Brigit, and was marked by torchlit processions through the fields to invite purification and fertility for the coming spring. Whether he was motivated to co-opt these pagan holidays or not, it was Pope Gelasius I who instituted Candlemas in AD 492 and fixed its date on February 2. The blessing of candles and candlelit processions supplanted earlier pagan rites and gave rise to the name of the holiday. That’s right. Pancakes. Somehow the French, in their infinite culinary wisdom, decided that there’s no better way to commemorate Mary’s ritual purification and the redemption of her firstborn than by pigging out on crêpes! Now, it’s not precisely clear why the French eat crêpes on Chandeleur, but there is a theory that Pope Gelasius himself gave rise to the practice by distributing pancakes to pilgrims arriving in Rome to celebrate the holiday. That would make sense. Those round, buttery, golden pancakes could certainly serve as beautiful symbols of both the sun that would soon return to warm the Earth after a long, hard winter and Jesus, the “Light of the World.” In addition, since February was the start of the winter planting season, leftover flour from the winter stock could be used to make pancakes as a symbol of the plenty that would hopefully arrive in the coming year. Speaking of “plenty,” the French also have a fortune-telling tradition on Chandeleur. While holding a gold piece (or these days, a 2-euro piece, I guess) in the left hand, the cook tries to flip a crêpe with the right. If the cook can successfully maneuver that pan and catch the crêpe with no resulting kitchen catastrophe, the year ahead will be prosperous. 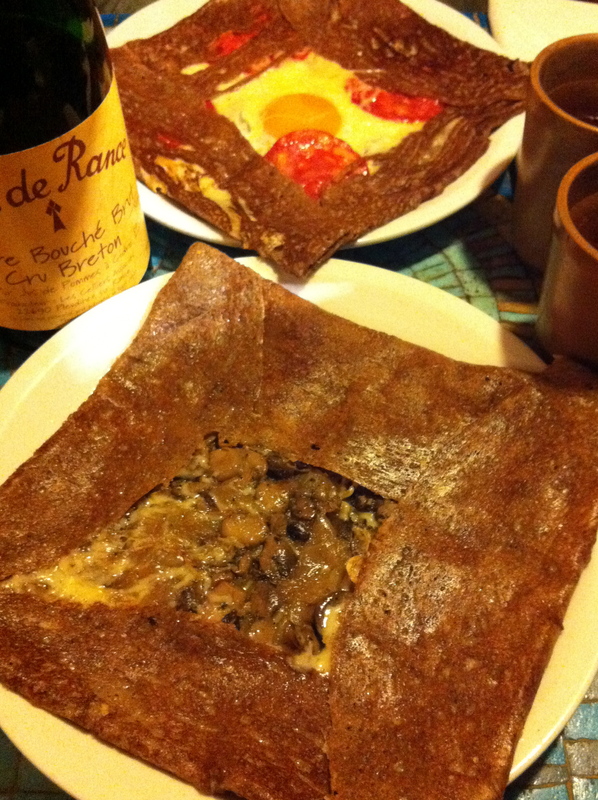 Despite the frigid weather this week in Paris, we’ve decided to venture out to one of our favorite crêperies tonight, so we won’t have the opportunity to try this at home. Knowing our luck in the kitchen, though, it’s probably better that we won’t tempt the fates! 9 P.M. Update: The pics from the crêperie! 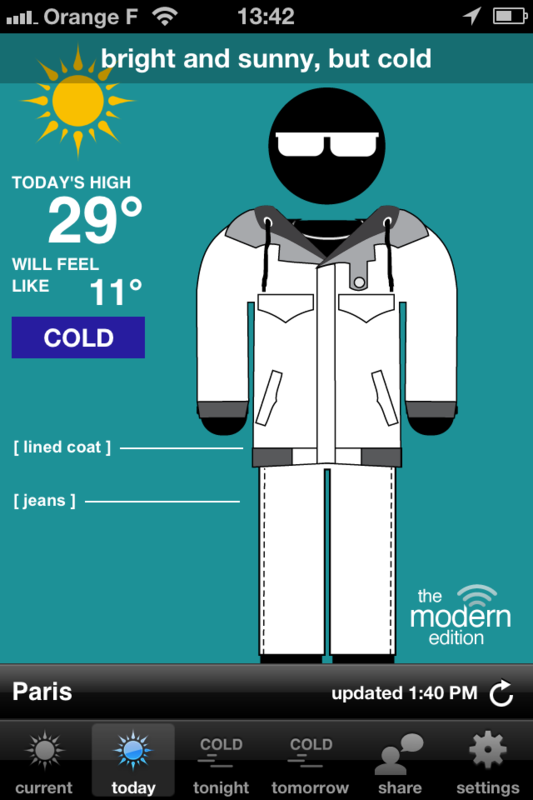 If you speak Celsius, that’s -2º for a high and -11º for the wind chill. … let’s get back to that groundhog for a moment. À la Chandeleur, l’hiver se meurt ou prend vigueur. On Candlemas, winter dies or finds vigor. Rosée à la Chandeleur, l’hiver à sa dernière heure. Si la Chandeleur pleure, l’hiver ne demeure. If Candlemas cries (if it rains), winter won’t stay. Si la Chandeleur dégoute, l’hiver est passé sans doute. without doubt (which actually means “probably”). Chandeleur claire, l’hiver derrière. Chandeleur trouble, l’hiver redouble. A clear Candlemas, winter’s behind. A stormy Candlemas, winter redoubles. Quand Notre-Dame de la Chandeleur luit, l’hiver quarante jours s’ensuit. When Our Lady of Candlemas gleams, forty days of winter follows. Now, wait a minute! This is all contradictory. Or maybe I just don’t understand French proverbs. Sigh. Alright, forget the wisdom of generations and generations of Frenchmen and just tell me what Punxsutawney Phil had to say this morning so I’ll know how long this is going to last! No, wait. On second thought, I think I might prefer General Beauregard Lee‘s prediction this year. In the meantime, I’m going to bundle up and go eat some crêpes. Happy Groundhog Day! Bonne fête ! ← How much French do you speak? 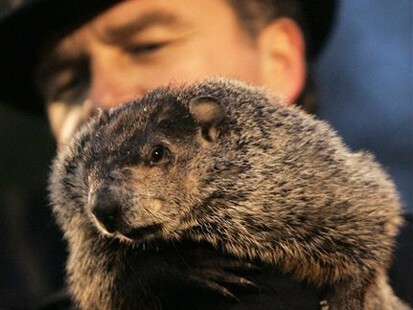 I’m afraid ol’ Punxatawny Phil said….six more weeks of winter! Sorry! Sigh. Yep. Well, thankfully, General Beauregard Lee down in Georgia is predicting an early spring. Of course, none of these groundhog meteorologists came over here to make a prediction, so who knows what I can expect! And it’s not like Météo France is any more credible. Ha ha! Good post! I never knew where chandeleur came from… I assumed something about light, and lent (the end of lent and beginning of carnival). 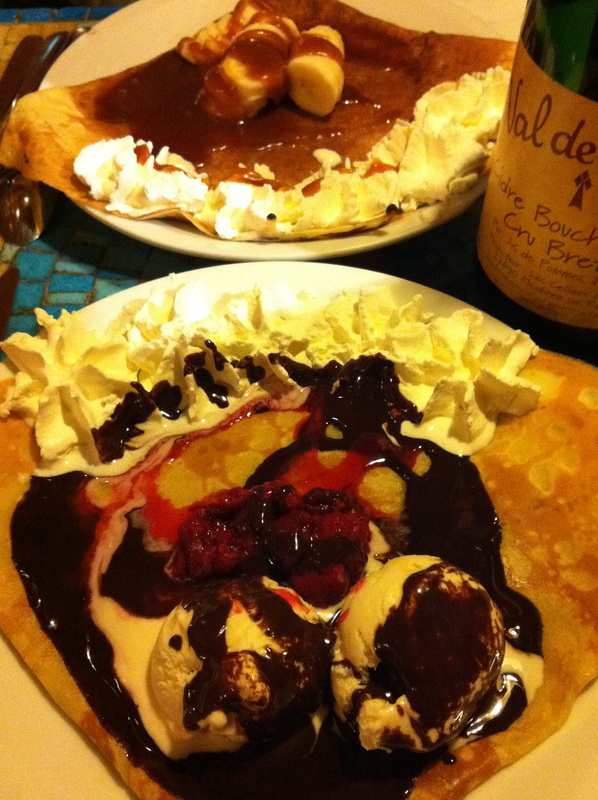 You taught me something there… Love crepes, so fun because it always around my birthday! Is Chandeleur earlier this year? I thought it was usually around the 20th, with carnival? Bon app’! Hey there! Thanks for the compliment and thanks for the reblog of http://wp.me/p1jg1T-TA! Very cool! It’s interesting that Chandeleur fell the day after my “How much French do speak?” post because I actually cite the origins of “candle” from the Norman French “caundèle” meaning “chandelle”—not thinking at the time that I’d be writing about it again the very next day! Because I’m kind of a church calendar nerd (not sure if you’ve picked up from my blog that I once was very seriously considering entering the Episcopal priesthood), I love the backstories of church holidays, even the seemingly minor ones. I was raised a Baptist (VERY Protestant), though, so most of these “little” holidays meant absolutely nothing to me growing up. Of course, I could recount the story of the presentation of Jesus in the Temple that is commemorated by the holiday without skipping a beat! Thank you, Sunday School! At the risk of boring you with too many details, Chandeleur/Candlemas is actually ALWAYS on February 2 because it comes 40 days after Christmas. It’s during the season of Epiphany, not Lent. You’re thinking of Mardi Gras/Fat Tuesday, I believe, which marks the end of the season of Epiphany and the beginning of Lent (the 40-day season of self-denial and contemplation before Easter). That’s what Carnival is all about … going hog-wild before Lent starts because we know we’re going to be miserable for the next six weeks! At the risk of being even more confusing, while the French celebrate Chandeleur with crêpes, the English (and by extension some Americans) celebrate Mardi Gras/Fat Tuesday with pancakes! Since the date of Easter varies every year, the date of Mardi Gras can also vary … sometime between mid-February and early March. I hope that explains it! Thanks for the clarification, you are so resourceful! 🙂 Believe it or not, I was raised baptist in the most catholic region of France! So I enjoyed the holidays (no school) and all the fun traditions (good food: mannala at St-Nicolas, bredele de Noel, galette des rois, crepes, chocolat et agneau-brioche pour Paques, etc. )… but since chandeleur was usually right around mardi-gras, I thought it was at the end of lent and the night before mardi-gras. I guess we were off by a few days in my family! You are welcome on the reblog… a little promotion for you. Cheers! Is coming up- I think NEXT weekend- ? Lots to Celebrate here! How ’bout this SNOW!!! There you go! I actually didn’t write about the snow, but I did write about martinis. Check it out … it’s very IMPORTANT! For years and years my family has always eaten pancakes on February 2nd. Yet no one ever knew why. Now we do. Thanks!!! As a Cajun, I’m guessing some of my ancestors brought the tradition with them when they came to Louisiana. Nice to know how it probably all began.